A popular Japanese rock band "Alice Nine" will be releasing their new single, Shooting Star on May 29 in 3 different version. Regular CD, Limited Edition Type A, and Limited Edition Type B. Contents of the 3 versions are yet to be known. It is their 3rd single being released this year. Preorder for the single is now available on CD Japan site. I highly recommend the song Shooting Star as it has a sweet yet smooth melody! Band members consist of Shou (vol. ), Tora (gui. ), Hiroto (gui. ), Saga (ba. ), and Nao (drum). 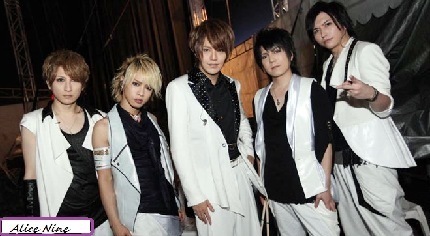 2013 marks the 9th year since Alice Nine was formed back in 2004. They manage to capture the heart of many listener with their unique style and lyrics. I do enjoy listeing to their songs a lot.